A mat foundation is a continuous foundation with a thick slab that supports a whole structure. The foundation is shallow and poured over reinforcing mats. They are sometimes referred to as raft foundations. 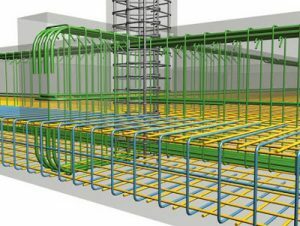 What is the difference between raft and mat foundation? Mat foundation is otherwise called as Raft Foundation and its working principle is similar to shallow foundation. Mat foundation is preferred for large space where separate footings are not possible to construct due to overlapping condition. Generally, Mat foundation’s footing will extend over a large area. The main reason why the Mat adopted by most Engineers is Mat will distribute loads equally to prohibit differential settlement. Mat is considered when the soil condition is so poor & weak. The Engineer wishes to take full advantage of the soil’s increasing bearing capacity with depth by excavating basements, and thereby seek a fully or a partially compensated foundation. A flat plate mat is used for fairly small and uniform column spacing and relatively light loads. A flat plate type of mat is suitable when the soil is not too compressible. A line sketch of this type of mat is shown in Fig 1. For columns subjected to very heavy loads usually the flat plate is thickened under columns as shown in Fig 2 to guard against diagonal shear and negative moments. When the column spacing is large and carries unequal loads it would be more economical if a two-way beam and slab raft as shown in Fig 3 is used. This type of mat is particularly suitable when underlying soil is too compressible. The function of this mat is same as that of flat plate thickened under columns. In this mat pedestals are provided at the base of the columns. This type of mat is used when columns carry extremely heavy loads. In such design, basement walls act as ribs or deep beam. When the depth of beam exceeds 90 cm in simple beam and slab mat, a rigid frame mat is referred. Fig 4 shows a typical rigid frame mat. In this type of construction, the mat is supported on piles as shown in fig 5. This type of mat is used where the soil is highly compressible and the water table is high. This type reduces settlement and control buoyancy.